She did her homework. And consumers got a temporary gift. A “suddenly hawkish” Yellen, as she is now being prefaced by some voices, brushed off the dip in inflation when she spoke after the FOMC meeting yesterday. Inflation backtracked a tiny bit. The Consumer Price Index rose “only” 1.9% year-over-year in May, and the core CPI without food and energy rose “only” 1.7%. “Only” in quotes because there is still enough inflation to whittle away at the purchasing power of wage earners who have to make do with stagnant wages and retirees who have to live off their near-zero-yield savings. But Yellen looked at the details of the inflation reports and discovered that there were some one-time or short-term factors that brought inflation down a bit – and none of them are going to last. She mentioned two of those “idiosyncratic factors” that are temporarily pushing down inflation. Prescription drug prices dropped, she said, but the drop was likely a one-time affair. 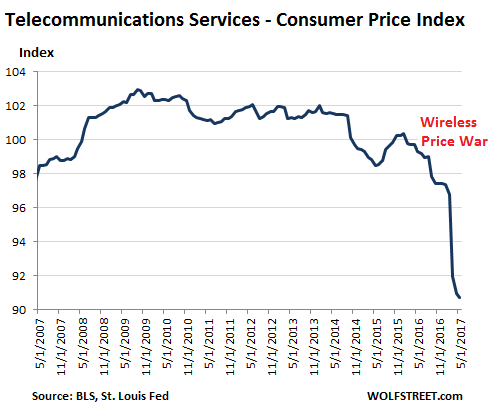 And prices for telecommunications services have dropped by a large amount as cellphone carriers are currently waging an all-out price war. And I’ll add a third “idiosyncratic factor”: used vehicle prices. A couple of days ago, Sprint, fourth largest carrier in the US, took the wireless price war to the next level and pulled the nuclear option: free unlimited wireless service for a year, but only to people who currently have service at another carrier and are willing to switch to Sprint. After a year, regular rates apply. Verizon customers are the primary target. I’ve been writing for months about the sharp decline in used vehicle values at the wholesale level. They’re down 13% from their peak, according to the NADA. This has caused all kinds of problems for automakers, finance and leasing companies, rental car companies, subprime auto-loan backed securities, and the specialized companies that issue these securities. But dealers love the dropping wholesale prices because their costs go down. And there is record demand for used vehicles at the retail end. So the lower costs are only partially being passed on to consumers. The rest is dealer profit. Used vehicle prices were immensely inflated during the “Cash for Clunkers” program when the government, to bail out the automakers, bought for all practical purposes an entire generation of perfectly good and affordable older cars and destroyed them so the people would be forced to move up to newer vehicles along the entire chain. This caused a surge in used vehicle prices from 2009 onward. But starting in January 2014, the impact from that lost generation of cars began to fade and prices began the long trajectory toward “normal.” This process got a new boost this year as a flood of rental cars and lease-turn-ins is hitting the market. Bringing used vehicle prices back down to normal is a great thing for car buyers, and the effect shows: used vehicle sales are on track to set a record this year. 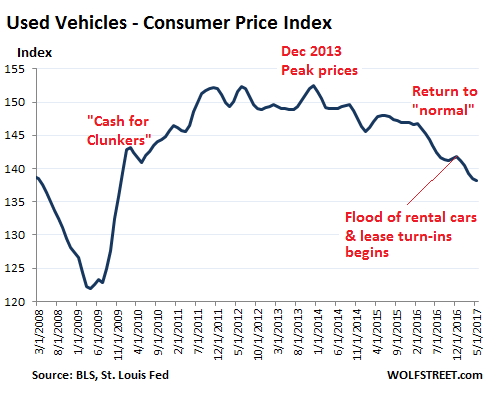 In terms of inflation, once used vehicle prices settle near a “normal” level, the impact on inflation will fade. Lowering the costs of wireless services is also a godsend for consumers. But there are limits to how much longer this can last. Sprint is in iffy condition and won’t survive a brutal drawn-out price war. So there will likely be a bounce-back. And for the longer-run inflation rate, the price war will have little impact. So Yellen may not have been “surprisingly hawkish” after all. She just did her homework and looked beyond the surface. And she saw, unfortunately for workers and consumers, that overall inflation is likely to get worse soon. ← What Happens When the Machines Start Selling? Inflation is already much higher than the Fed’s fictitious number according to reputable sources such as Shadow Stats, and a multitude of other data. Yep, and the FED isn’t tightening right now cause all is roses, they’re tightening now cause the cycle has turned and they’re going to help it collapse, like central banks have been doing since their inception. Gullible is one who believes central bankers when they tell us their job is to stabilize the economy. In reality ? None of the above . Try more like educated , well informed , discerning , investigative rather than accepting as well as extremely skeptical of simplistic answers to extremely complex problems especially those ‘ answers ‘ coming from less than legitimate sources [ not to mention unsecured websites ] in the desperate attempt to create ‘ shadow ‘ scapegoats for which to blame the world’s ills on when in reality there are a host of guilty parties involved including the general public and the consumer him/herself . Let me ask you something serious. Do you honestly believe the Fed pays people to go out on various websites and… do what, exactly? How many people? How much does these jobs pay? What websites do they visit? When you post zany things that make no sense to people with an iota of rationality, you will get accused of being a “tin foil hat guy.” That’s how it works. Banks are full of buckets of derivatives written against short interest rates never going up or business deals going south? The banks have main street and the fed on the hook for even bigger losses and they us interest on excess reserves to paper over continued massive negative numbers on mark to fantasy legacy’s assets? And hope u never talk to your neighbor about this economy? Raising rates is a double whammy and then after dodd-frank the fed starts hitting the budget for interest payments to itself? Shadow Stats is not reputable. They take the Fed’s “fictitious” data and add a made-up premium on top of it. If you think the Fed’s data is “fictitious” then by definition Shadow Stats is even worse. Agree but i think it’s still “stealth” inflation concentrated in certain segments. we will have to complete this deflationary cycle. once the trillions of printed fiat finally enter the global economy we will see massive inflation returning to the stage,don’t think we’re quite there yet. possible events to trigger: pick up in demand for goods and services globally. a sudden spike in the price of oil would raise prices for EVERYTHING. a dollar devaluation? you can add your most likely scenario,the clock is ticking and the mountain of hey is just sitting there waiting for the spark…..
Color me surprised, someone competent has the job. And of course if the new military budget gets a pass, inflation will go up. I don’t know anything about this program but I assume it was voluntary. Also. I’ve seen folks trapped by an older car with terrible fuel economy. They were burning the value of the car, say a $1000, every 2-3 months in gas. I’ve always thought the program helped them get more efficient cars. Are there any folks who used the program to their benefit? Sure, people got either $3,500 or $4,500 for eligible cars if they bought a new vehicle. That was the incentive. It cost taxpayers $3 billion. So it helped people who traded in their “clunkers” for a new vehicle. But it destroyed the used vehicle market in older models. For years afterwards, those affordable older cars were gone, and millions of people HAD to buy more expensive cars that they often couldn’t really afford, which as a result, saw a surge in prices. My three-year-old car at the time gained about $1,500 in value over a couple of years. It was completely nuts. A car that you drive doesn’t get more valuable. It gets less valuable. You see that distortion in the chart. In a prior article, I also pointed out that distortion in the NADA chart of its used vehicle value index. I always thought zirp pumped up the used market but I agree CFC did it. With myself being a car guy people would always ask me to be on the lookout for a reliable $3000 car. I quickly realized they didn’t exist anymore. In 2010 I purchased a co-workers lease end and drove straight to Carfax and made a $2500 profit. In regards to fuel economy, I don’t buy it. A gas guzzler when old was a gas guzzler when new. I had a 1988 Honda that got 45 mpg all day every day. It sure helped Ocean Reef Club (home to the really rich and famous) in Key Largo got rid of the old golf carts and got new ones. “got either $3,500 or $4,500 for eligible cars if they bought a new vehicle.”. Guess golf carts were eligible. The next time a program like CFC kicks in it will likely be to get more new fully autonomus cars onto the road. Cash for clunkers was a gift for dealers and car makers. It did nothing for consumers since car prices immediately were adjusted to account for all of the subsidy. Is it just me, or has the Fed been acting differently this year? Less public talking, double-speak disappearing, visibility reduces. And they seem to be sticking to a measured plan to hike & tighten. Makes me wonder if the supposedly non-political Fed was being pressured by the Obama administration to goose the markets. Boosts Obama’s legacy, leaving office with record highs and helping pave the way for Hillary in 2016. I don’t know if there is “less public talking.” There is quite a bit, but the cacophony is gone … they’re all singing from the same page (except Kashkari… the new guys after his failed run for governor of Cali. I don’t know the reasons why. And I don’t want to speculate why. But something definitely changed last fall, before the election … when Rosengren first started talking about unwinding QE and no one opposed him. That’s why I keep writing about it. I used to call it the “flip-flop Fed.” No more. Agree the Fed has quieted down somewhat and the slowly rising rates are welcome. Running down the balance sheet is at trivial amounts, but still a possible trend for the better. My skepticism as to their motivations tends to be cynical, but I also feel, accurate. They got their orders, but the long term purpose is still a little cloudy. One possibility is that the Fed will save the world down the road when Japan and/or China and/or the Eurozone has a LCTM moment and it needs a cleaner balance sheet and room to move on rates. The recent signed letter from the 22 Fed supporters I think might have been misinterpreted in the press. I think it was a call to abandon the 2% inflation rule and try to better see the world as it actually is. They also seemed to frown strongly on zero bound rates as being a failure in concept and application. However, it was also couched in econo-blabber and was therefore mostly unintelligible, probably even to them. 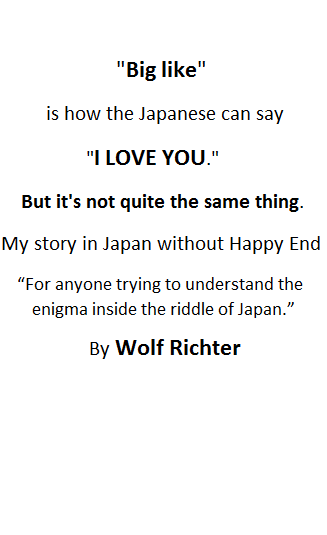 Its obtuseness left a lot of wiggle room for interpretation and could even later be described as a call to go Japanese if needed. There’s a hidden agenda in there somewhere. We’ll have to watch what they actually do and/or say and try to filter out the distractions, including and especially their explanations that use nonsense, economic superstition, and gobbledygook as academic reasoning. Right now, the trend is normalization at a glacial pace. However, Bernanke said rates would not normalize in his lifetime, and that prediction is still possible. FED understands that all of their actions will lead to some results. They also understands there is NO sound theory to tell them exactly WHAT will happen and WHEN will happen. This was the talk given by a MIT economists back in 2008. If the FED understands this, then the only measure that can reduce large swings in actual economy is to be consistent (NOT changing course) for long enough time. You can criticize this approach intuitively. But from sicientific point of view, if you are dealing with a large system that has unknown long delays, the only measure to make it stable is by observing for time longer than the delay and act slowly to control it. Berkanke was saying in 2009 that low rates will last till 2015. This is the thinking at least. Opposite is true as well, if they are on the tightening path, they would NOT suddenly change their mind and go easing again dramatically. Unless some politicians panicked and force fast responses. It has been obvious for the past 8 years that the Fed was protecting Obama’s legacy with their policies, 2 rate increases in 8 years, one of them after his successor was chosen. We have had more rate increases since the election of Trump than the the 8 years Obama was in office. Can’t believe anyone is surprised by this. I really hope Janet Yellen is rethinking QE, and is now considering the financial stability risks it has created via inflated asset prices and rising debt. If the Fed’s mandate is focused on employment and price levels alone, that’s a serious problem. Financial stability and avoidance of stock market crashes should be a third part of the mandate. The Fed’s ‘mandate’ is a law, not a preference. Stable prices and low unemployment are their legal responsibilities. That being said, they have 200% latitude to define those terms and how they intend to meet their mandate. To them, 2% inflation is a stable price, and inflation is measured using a formula that ignores a lot of inflation. Economists have made up a lot of fictional theory to support that objective. (If they didn’t support the mainstream, they would be unemployed economists … like WAPO and NYT and CNN reporters with Trump.) Likewise with how they define unemployment and acceptable levels. I could sit here and easily spin 3 different scenarios to justify different stable price definitions. All would sound important and make perfect sense and all would be total BS. The Fed is no different, only they use econo-babble to do it using inscrutable reasons. Reality to them is dictated from some globalist ideal or whoever pulls the strings most at any given time. To them, financial stability is protecting the bubbles they built while denying their existence. It could be worse, however. See Japan, the Eurozone, and China for examples. Its a function of hard goods prices dipping: autos, homewares and general weakness in manufacturing sector. Without that Core PCE would be 2.4% and rising. In addition I’m a used car kind of guy so when I needed to buy a replacement automate price was higher than it should be…..
Nick, all government programs involve the few benefitting at the expense of the many…. So why the heck do you ask if anyone benefitted from this government give away. It’s always immoral and not to the benefit of the nation for this kind of interference or any kind of interference in the free market. That gas hike was an obvious manipulation to get folks to trade in their probably paid off gas guzzlers to keep the car industry afloat during the car industry crisis (2008-2010)…when all of the CEOs flew to Washington in their private jets. That is also when the damn ethanol came online big time which reduces gas milage by 10%. So go figure. Alfred Hitchcock mastered the MacGuffin – the made up reason for the plotline. It’s the motivation. It may or may not be a real need … it’s just an excuse for action that the audience can be made to believe in. The script MUST treat the concept with respect and the actors must not break out laughing if it’s a comical excuse being made to look serious and sell a story. Holes in plot-lines are always ignored, if necessary. ‘Inflation’ is the central bank MacGuffin. The concept was sold so well that we’re nearly 10 years into massive QE and still hunting snipes. I like that. Great analogy. No “dip in inflation” esp. when in numbers manufactured by gov’t. CPI is a joke. BTW, the definition of inflation is an increase in the money supply. Prices can be and are manipulated to the fullest extent of the law in the shell game of BS BLS statistics, but it’s clear that $20T of debt (what debt ceiling?) has to be financed with fiat currency “ex nihio”. If no one can find inflation, just look at: housing, college tuition + textbooks, medical insurance + healthcare, food, restaurants, etc. The Fed and other CBs enable unrestrained gov’t. spending and the creation of multiple economic bubbles with low rates and easy money. It’s not different this time. Make that “ex nihilo” (out of nothing). Inflation can be defined many ways– an increase in money supply is usually a CAUSE of inflation, but is not BY DEFINITION inflation. Inflation is a rise in PRICES, which can be caused by an increase in money supply and/or credit, but is also affected by other factors. Chapwood is a joke, by the way. The Chapwood index is based on self-reported prices of things his friends buy– including things like “luxury box tickets,” “country club membership,” etc. The items make no sense, and the methodology is a joke. Zero credibility. The reduction in the purchasing power of a currency. Inflation has historically occurred when a country prints too much of its currency in too short a period of time. Yes, inflation is often defined as price increases, but also as an increase in the money supply. Both definitions are directly related. Name your poison. Chapwood and SGS-Alternate (1980-Based) give similar numbers. Many agree w/ the SGS numbers. The official gov’t. CPI number is well known to understate inflation. To accept the official CPI is delusional. What counts is the purchasing power of the dollar. This has declined >95% since 1913.
the true legacy of the Obama years is his allegiance to the TBTF and TBTJ banks. Geitner, NY Fed chair was made Treasurer etc. The Banks got bailed and bonused and then got the houses too at 30 cents on the dollar. We ll want to remember that the TBTF ? TBTJ banks are the stock holders of record of the Federal Reserve. Trump is an interloper who might interfere with these cozy relationships and re set a middle class revival. On the other hand there are those who think the the banksters got Trump in so he can be blamed for the collapsing economy; then they ll get rid of him and go back to business as usual running the US economy, it s foreign policy and all else. Trump is not an interloper, and he doesn’t give two squats about the middle class. Look at his economic team… it’s virtually all Goldman Sachs alum. Yellen and the rest of the “former” Goldmanites at the central banks know their Ponzi markets and asset bubbles are on borrowed time. They also know that when the financial house of cards built by these Keynesian fraudsters on created-out-of-thin-air funny money and ultra-easy credit comes crashing down, furious populations are going to rightfully blame the Wall Street-Federal Reserve Looting Syndicate for their financial wipe-out. So now, too little and too late, Yellen is going to have to try and pretend to be a responsible central banker instead of an accomplice and enabler of the oligarchy’s pillaging of the productive economy. You mean Friedman Fraudsters. All of these rotten, manipulative Fed policies are right out of Milton Friedman’s playbook to socially engineer a society of rich elites and subservient masses. Milton Friedman (and Ayn Rand) are the evildoers. Keynes had his brain functioning normally. Fed Friedman Fraudsters. I disagree with who will get the blame. The Mainstream Media and Golablist will blame Trump and the Lemmings will believe it. It certainly doesn’t surprise me, considering Amazon started opening “smart grocery” stores at the end of last year. It makes sense that they’re looking to attack the grocery industry like they’ve done to other retail. I’d imagine they’ll get things to the point where we receive all non-perishable food items in the mail, and then have small local stores for the perishable stuff. Whole Foods probably gives them the network to get that going. So apparently housing prices aren’t included in their inflation numbers ? Housing is considered an “asset.” So rising home prices are part of “asset price inflation,” which has run rampant. Rents are included in “consumer price inflation.” This is measured by CPI and other indices. Then there’s “wage inflation,” of which there has been very little. 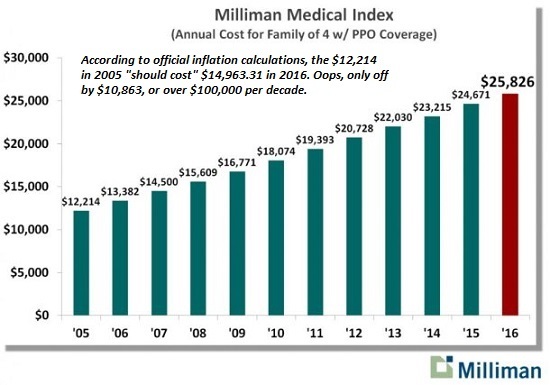 This article covers consumer price inflation. Many other articles here have covered the various forms of asset price inflation – the “bubbles” as we now call them… housing, commercial real estate, stocks, bonds, etc. They’re not. But even if they were, when people think of housing they tend to focus on the headline cities… NYC, San Francisco, Seattle, etc. etc. and forget the whole 99% of Middle America… where house prices haven’t really inflated much at all. The Central Banks kept the markets up and maintained asset prices but there was no trickledown into the secular stagnation of the new normal. They need to get the bad debt out of the system and let it crash. The markets are supposed to represent the real economy. Lifting the markets up and expecting the real economy to rise to meet the valuations had everything round the wrong way. The real economy should drive the markets, the markets don’t drive the real economy. I disagree. What is the impetus for “overall inflation” to get worse? There’s no wage growth, which traditionally is one of the biggest drivers of inflation. You’ve got a number of asset bubbles, which implies they won’t be growing that much more, and could in fact pop and crash. We’re probably due for a recession soon… which would be interrelated to all these factors. 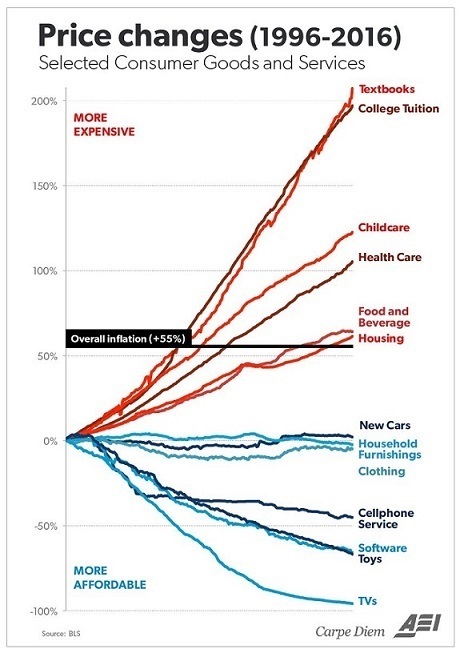 All of which are… deflationary. The Fed has been wrong about inflation and growth for years now. And they’re STILL wrong. The lack of inflation (as they see it) is not transient, just as the lack of growth for the last 8+ years now hasn’t been “transient” either. The bond market doesn’t buy it, either. Don’t be surprised to see an inverted yield curve by this time next year. And I just read Kashkari’s comments on ZeroHedge, which pretty much confirmed exactly what I was thinking. But it has not. Why? Because labor markets are not tight in the sense that businesses can’t find people to hire… they’re tight in the sense that businesses can’t find people to hire that they can afford. There’s a huge difference between the two. In the first situation, to hire laborers businesses increase wages —-> this in turn causes inflation, traditionally. When the Fed sees low unemployment and businesses struggling to hire, they see a tight labor market and inflation as the direct result of this. However, in the second situation… the one we’re actually living in… the economy is weak, and businesses can’t AFFORD to hire workers at a market clearing wage —-> this has the appearance of a “tight” labor market, but it’s totally different from the first situation. If their estimate is correct, I believe these would be either the weakest consecutive quarters for GDP growth since 2009… or second weakest. This is simply not an environment where inflation is going to take off. There are only TWO ways to address the oceans of debt created in the last couple of decades: “monetize it” through inflation (make you and me pay for it),devaluation of the dollar OR: grow the economy at a rate of 3 to 5 % for several years (same result,inflation but with the added benefit of being able to service that debt) scenario # 2 not very likely at this stage i would reckon so where do we go Mrs Yellen? The Fed will continue to tighten into this obvious economic downturn. The resulting great Recession II will be blamed on Trump. They knew a recession was unavoidable so this way they get to pass the blame. Look at all the BS Fed speak statements. The economy is strong; can withstand more rate hikes. Right!? No question. We’re headed down. Intentionally. And Trump will flame out. I predicted when he was elected, that he would never serve 4 years on office. I still hold by that. Will be lucky to make two.